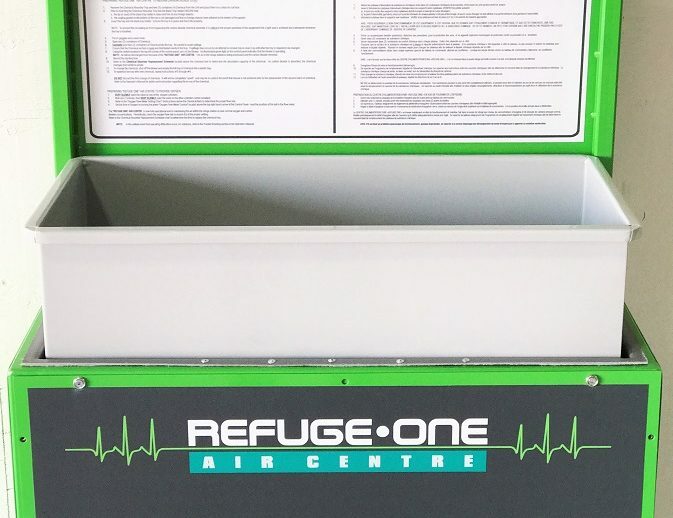 ON2‘s Refuge One Air Centre provides and maintains a source of Breathable Air during an underground emergency. The Air Centres may be used in a permanent Refuge Station or in a Mobile Refuge Chamber such as the ON2 TommyKnocker. The unit removes excess CO2 by passing the chamber’s air through sodalime scrubbers and replenishes O2 from high pressure O2 cylinders at a metered rate based on the number of occupants. It is compact, sturdy, easy to operate and can work independently despite the loss of the mine’s electrical power or compressed air supply. The single bed scrubber provides CO2 absorption using 80 SCFM of air flow. Please refer to “The Performance of Refuge Air Centre” information summary.